Integrated Threat Intelligence Providing Visibility into Events that Matter to You! You’ve already invested a great deal in your security infrastructure to prevent, detect, and respond to cybersecurity attacks. Yet you may feel as if you’re still constantly putting out fires and are still uncertain about your current cybersecurity posture. You’re looking for ways to be more proactive, more effective, and more strategic about your defenses, without having to “rip and replace” all your existing defense infrastructure. You need the right cyber security intelligence, delivered at the right time, in the right way to help you stop breaches. Help me increase the velocity & accuracy of threat detection. Enable me to correlate Sumo Logic log data with threat intelligence data to identify and visualize malicious IP addresses, domain names, email addresses, URLs and MD5 Hashes. Alert me when there is some penetration or event that maps to a known indicator of compromise (IOC) and tell me where else these IOCs exist in my infrastructure. And above all, make this simple, low friction, and integrated into your platform. And listen we did. Threat intelligence is offered as part of Sumo's Enterprise and Professional Editions, at no extra cost to the customer. 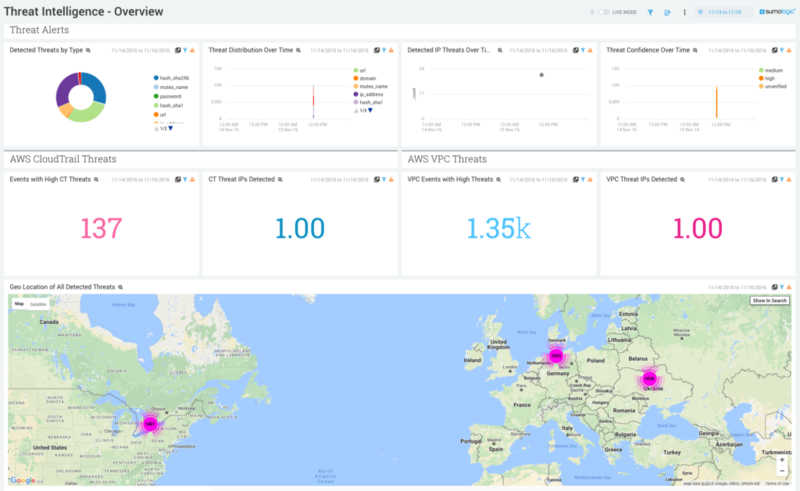 Supercharge your Threat Defenses: Consume threat intelligence directly into your enterprise systems in real time to increase velocity & accuracy of threat detection. Be Informed, Not Overwhelmed: Real-time visualizations of IOCs in your environment, with searchable queries via an intuitive web interface. Achieve Proactive Security: Know which adversaries may be targeting your assets and organization, thanks to strategic, operational and technical reporting and alerts. We chose to partner with CrowdStrike because they are a leader in cloud-delivered next-generation endpoint protection and adversary analysis. CrowdStrike’s Falcon Intelligence offers security professionals an in-depth and historical understanding of adversaries, their campaigns, and their motivations. CrowdStrike Falcon Intelligence reports provide real-time adversary analysis for effective defense and cybersecurity operations. To learn more about Sumo Logic's Integrated Threat Intelligence Solution, please go to http://www.sumologic.com/application/integrated-threat-intelligence.